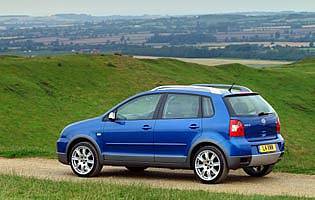 The trend towards 'faux off-roaders' continues unabated and the Polo Dune is one of the more desirable models around. The beefed up supermini is all about aesthetics as its off-roading ability is limited to the occasional jaunt up a kerb. There are several manufacturers out there who think that slapping plastic cladding and extra kit onto one of their superminis will some how make them more attractive to buyers. 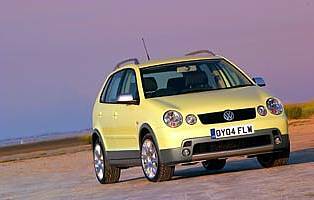 And they'd be right, if the Volkswagen Polo Dune is anything to go by. Although it is dressed up to look like a little cutesy wee off-roader, the Dune is simply a two-wheel drive Polo with a few extra goodies and some adventurous paint jobs. It looks fun and is obviously designed to appeal to the younger, more image conscious group of buyers. Other contenders in this faux off-roader shoot out include the Citroen C3 XTR, Fiat Panda 4x4 and Rover Streetwise. While the VW has the best image of the bunch thanks largely to its badge, the Fiat is the best equipped for tackling the rough stuff – just make sure you don't get carried away. 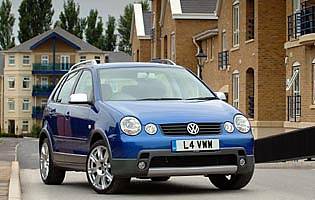 An elevated ride height and big alloys look good but have really taken a toll on the Polo's usually composed road manner. Some interior trims will also be too much for conservative tastes. Looks cute and stylish and is certainly more interesting than the standard Polo. However, the jacked-up ride height has had an adverse effect on handling and road manners. The Dune isn't too expensive given that it wears a Volkswagen badge on its nose. Combined fuel economy of nearly 45mpg should also make trips to the pumps mercifully infrequent. Insurance won't break the bank and the Polo has proven to be relatively trouble free. It's a supermini, so one shouldn't expect miracles. The Polo's cabin isn't the most cramped in its class, but it still isn't what you'd call spacious. A 270-litre boot is adequate for a couple of small cases or a medium-sized shop. There are several neat little cubbyholes dotted throughout the cabin in which to stow your specs and sweeties. It may be getting on a bit in design terms, but the Volkswagen purple dial arrangement continues to impress with its soothing, calming hue. The rest of the Polo's controls and displays are beginning to show their age a little. All knobs and dials feel nicely weighted and connected, but they simply aren't as good as some more modern examples. There is a fair amount of wind noise thrown up by the roof bars and the wide tyres create some road rumble. In general terms the Polo's cabin is a relaxing place, thanks in no small part to the dials that glow purple at night and comfortable seats. A height and reach adjustable steering wheel allows even the tallest and most oddly-shaped individuals to find a comfortable driving position. All Polos are fitted with an electronic immobiliser as standard, while from S trim upwards central locking and an anti-hijacking system are also included. A fully integrated stereo unit will also prevent any disillusioned youths from participating in a spot of smash and grab. Dual front and side airbags as standard help the Polo maintain its reputation as a 'small but tough' car. ABS, HBA, EBD and Isofix child seat anchors complete the Polo's safety kit specification. A supermini, no matter how it is presented, is still a supermini. They make town driving effortless but that is as far as any 'driving appeal' goes. The Dune has been dressed up to look like a mini mud-plugger, although in real terms it is hardly likely to be fording too many streams. A supermini is of limited appeal to anything other than a young, small family. It could, however, pay a useful role as a second or third car for short shopping trips and school runs. Although it may be an expensive proposition for many teenage drivers, there wouldn't be many complaints if Junior found the keys to a Dune under the Christmas tree. It doesn't have quite the desirability of a hot hatch, but then again it doesn't have the same sky-high insurance premiums either. The roof bars will prove handy for transporting bikes, surfboards and the like and there is more than enough room onboard for a couple of mates. This remains an area where Volkswagen excels. Whether the German manufacturer's reputation for engineering excellence is fully justified these days is a matter of opinion, but it continues to enjoy a first class reputation. The lowly Polo doesn't quite generate the same amount of street cred as its larger sibling, the Golf, but in Dune or GT guise it exudes a certain amount of kudos. Three-door models obviously present more access problems than their five-door siblings. The front folding seats create a gap that the less limber will struggle to get through. In five-door guise, however, there are no such problems with four good-sized apertures making access fairly straightforward. The adequately sized boot is a bit of a stoop down, but only the seriously immobile will find it a real chore. A cassette deck or CD player is fitted depending on which trim level you go for. The CD system fitted on the Dune is adequate to drown out the road and wind noise. It can start to sound a little tinny as you turn he dial further round to the right, however. Indigo Blue looks particularly fetching when offset against the Dune's robust grey plastic cladding. Diamond Black and Grey Anthracite are a little more subdued and refined. Be careful which interior option you plump for as there are some rather garish shades on offer, Lime and yellow spring instantly to mind. Much of the interior is covered in black plastic, which can become a mite oppressive on long hauls. No parking sensors on offer as standard, but given the diminutive dimensions of the Polo this shouldn't present any real issues. Lots of glass all round and a nice, high driving position make performing multi-storey manoeuvres and the like easy. Light steering is also a boon for city driving. A space saver is fitted as standard. Engine options include two 1.2-litre petrol units (55PS and 65PS); three 1.4-litre petrol units (75PS, 86PS and 100PS). Diesel options include a 1.4-litre TDI (75PS); two 1.9-litre TDIs (100PS and 130PS) and a 1.9-litre SDI (64PS). All models come with a five-speed manual gearbox as standard, with the exception of 75PS 1.4-litre models, which are also available with a four-speed automatic and 1.9-litre TDIs (130PS), which feature a six-speed manual. Trim designators include E (base), S, Twist, SE, Sport, GT and Dune.